You can delete imported posts in the same way that you delete all other Shopify posts. Go to "Blog Posts" within your Shopify admin. 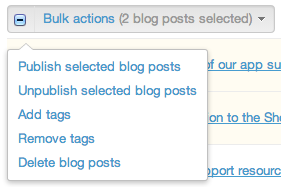 Check the boxes next to the posts you'd like to delete, then go to "Bulk Actions > Delete blog posts". Any imported posts that have been deleted will not be re-imported. BlogFeeder notes that these posts should not be part of the blog, and will ignore them when checking for imports and updates.